STOCKTON – For someone who chews with his mouth open and gnaws on a wooden post, Idaho Gem commands attention. Gem, a bay-brown mule with a quick kick, is guarded by three security cameras mounted above his stall, unlike any of his neighbors in Barn Q of the San Joaquin County Fairgrounds. He is the first member of the horse family to be successfully cloned. 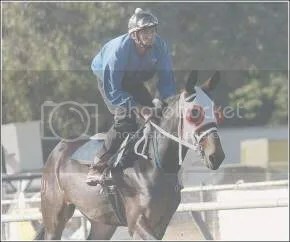 Gem has quietly taken up residence at the fairgrounds as he trains for his first race next month. Mule racing has become a popular, big-money attraction at fairs throughout California. But the scientists who cloned Gem and two of his brothers say their work could assist them in another race: that of a cure for cancer. Gem is unaware of all this, of course. He knows only the predictability of his daily routine: jogging on the racetrack in the morning, chomping five buckets full of hay and barley each day and showing off for visitors who snap his picture just like they did when he was only hours old on May 4, 2003. “Some people say he’s just a mule,” said his trainer, Ruby Thomas of Sacramento. “He’s not just a mule. He’s special, and I treat him like a god.”Gem and one younger cloned brother, Idaho Star, will race against each other and other mules in Winnemucca, Nev., in early June. That’ll be the first athletic competition between clones of any kind, proponents say. Gem will hoof it again at the San Joaquin County Fair starting June 14, when the public can get its own look at his exceptionally shiny coat. His story begins shortly after Dolly the sheep brought cloning out of science fiction novels and into newspapers. 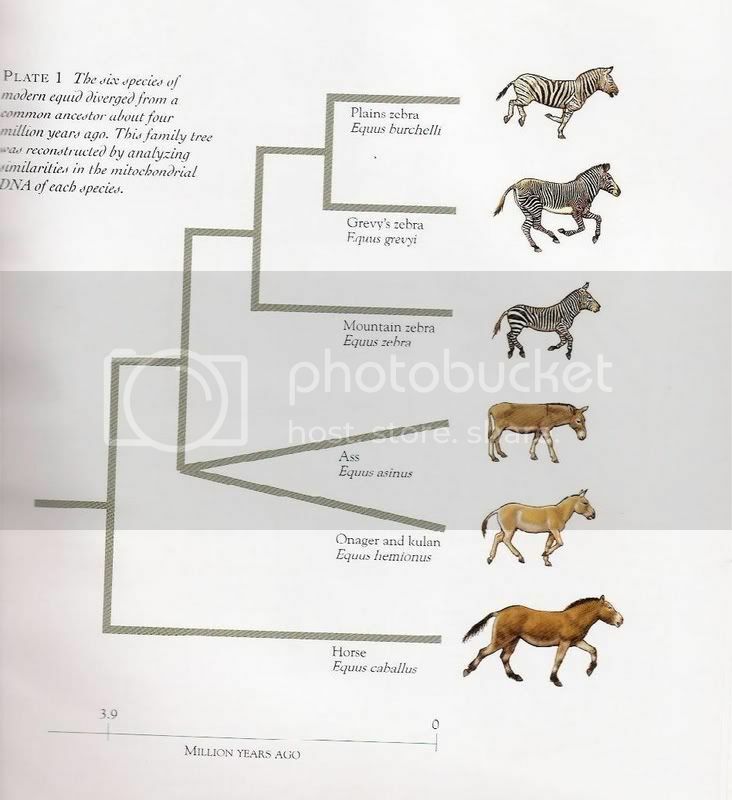 In 1998, Idaho businessman Don Jacklin and a team of scientists from the University of Idaho and Utah State University decided they would try to clone a member of the equine family. Mules, a cross between a male donkey and a female horse, are almost always sterile. Jacklin, a mule racer who invested money in the cloning endeavor, wanted to find a way to carry on the legacy of his champion racing mule, Taz. Jacklin contributed more than half of the roughly $750,000 cost of the project, officials said. State revenue from horse races also helped pay the bill. Rather than taking DNA from Taz himself, scientists bred his parents and produced a fetus from which they harvested skin cells. The DNA from those cells were injected into horse eggs, which were then implanted into mares. The experiment stumbled out of the gate. Out of 134 eggs, just two pregnancies developed – and they didn’t last long. In 2001, scientists increased the amount of calcium around the implanted eggs. Calcium spurs cell growth and activity. And indeed, of the next 175 cloned embryos, 19 developed into pregnancies and three foals were born. Scientists are now investigating how regulating calcium levels in cells could prevent tumors from developing in humans. Idaho Star is expected to join Gem in Stockton today. The other brother, Utah Pioneer, is said to be especially strong-willed and will not race, staying in Idaho instead. Gem and Star, however, could see as many as 11 races at fairs throughout the state this summer. It may be just the start of a long career. Gem’s backers say they believe he will be competitive. But there’s more than genetics to making a strong racer. San Joaquin County Fair Chief Executive Officer Forrest White said it’s hard to predict a mule’s performance at race time. He might dig in his heels right at the gate, earning his stubborn reputation. But the big fly-flicking ears are a fan favorite at the fair, which has featured mule racing for about six years, White said. There are no prohibitions against clones in the mule racing industry. That’s not the case with thoroughbred racing, but Jacklin hopes someday sterile horses might be legally cloned. Cloning will never replace sexual reproduction, scientists say, but can help perpetuate good genetic traits and perhaps preserve some species. Few ethical arguments have been voiced about the mule experiment, Jacklin said. “Believe me – right upfront, we are opposed to human cloning,” he said. But animal cloning is bad enough, some groups say. Wayne Pacelle, president of the Humane Society of the United States, said cloning experiments have caused arthritis and other physical problems in clones. The debate is far beyond Idaho Gem, who swishes his tail in the Stockton sunshine and waits for his big day. He and his brothers may be million-dollar mules, although the university says it can’t put a value on them. “To us, they’re priceless,” Professor Woods said. 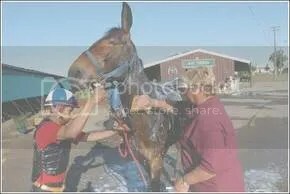 Ruby Thomas, trainer for Idaho Gem, washes him down after his morning exercise. Idaho Gem is one of two cloned mules that will be racing at the San Joaquin County Fair this year. Helping Thomas with Gem is Jose Luiz. 1997: Scientists in Scotland announce the birth of Dolly the sheep, the first mammal to be successfully cloned. 1998: Team of University of Idaho and Utah State University scientists and an Idaho businessman try to clone a member of the horse family. They harvest skin cells from a mule fetus and put the DNA into eggs carried by surrogate mothers. 2001: After three years without success, the scientists alter the calcium levels surrounding the embryos to allow them to develop more quickly. May-July 2003: Three foals are born. They are genetically cloned brothers of a champion racing mule. February 2006: The first of the three brothers, Idaho Gem, arrives at the San Joaquin County Fairgrounds for race training. 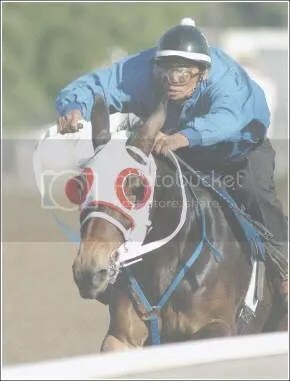 June 2006: Idaho Gem and younger brother Idaho Star expected to race first in Winnemucca, Nev., and then at the San Joaquin County Fair.